MS Excel has huge number of users over the world and these numbers are increasing day by day because every time it comes with new features. People use the excel sheet to maintain the data in a good manner. Have you ever tried to apply the validation on the cell? 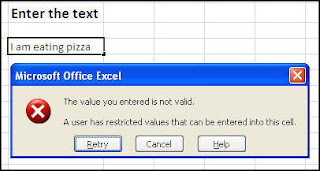 If your answer is no, then read this blog to know about validation option in MS Excel. Suppose, you want to set the validation (restriction) on a cell that, when someone is trying to enter a data which is more than 15 characters or against the validation then, it will throw an error in the screen to warn the user. Step 1: Click on the Data tab. Unser the Data Tools option, Data Validation option is available.